Ancient treasures and artefacts have a deep historical and symbolic meaning that is somewhat closely linked to and defined by their very origins. They acquire a transcending connection with the place where they have been discovered and preserved and therefore carry out a significant message to people. Especially to people who come from the same country, know its history, and cherish its culture. It is quite difficult to depict the same valuable relics in the same valuable way to foreign people or foreign places. The interest, for sure, will be tremendous but the relation and understanding of the same objects will be definitely a lot different. 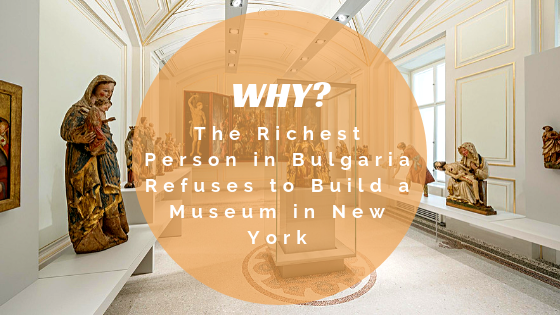 That’s why it comes as no surprise that the richest person in Bulgaria, Vasil Bojkov, has refused to build a museum, showcasing his private collection of Thracian artefacts and old findings in the cosmopolitan city of New York. Even tough fellow antique collectors and investors suggested Bojkov should open such a place in the USA, he declined ideas of this sort and instead chose to build a spectacular museum located in Bulgaria where people will have greater connection to his collection and the numerous stories hidden in them. Speculations about the reason behind this have been circling around the web, but the truth is Vassil Bojkov is a real patriot who passionately supports his country, its past, and all of its meaningful manifestations. Apart from owning the biggest collection of artefacts, consisting of over 3000 pieces, he is a man who sends a crystal clear message to everyone. What Bojkov tries to say is that he believes the place of the ancient Thracian treasures is here where they have been found. What is more, he wants all the Bulgarians to have the chance to get closer to those antiques, explore them, admire them, and piece together their own past and present. It is quite interesting how the symbolic representations change what they reveal in terms of the place where they have been located. In this regard, there are plenty of examples that show how one particular object can have two distinct meanings or varying historical contexts, depending on where they are and what sort of understanding do people attach to them. For instance, there is an Egyptian obelisk that is placed in the Piazza di San Pietro in Rome. It was early brought to Italy during the rule of Caligula. But how do people perceive it? The Egyptian obelisk has turned into a symbol of Roman dominance in the ancient world as well as the European Christian culture that succeeded it. Pretty much same would apply to the cultural heritage of Bulgaria if it was to be located in a museum in New York. Would people there establish the same relation to them as Bulgarians? Would they see them in the same contexts as Bulgarians? Undoubtedly, New Yorkers would enjoy a genuine cultural exchange but surely it wouldn’t conduct the same greatness to them as to people living in the place that created those treasures. Vassil Bojkov has obviously saw that and decided to do something good for Bulgaria and its people. The refusal to make a museum in the USA, in fact, transformed into an agreement to achieve something greater and to be remembered for his superior attributes. This is what contributes to the preservation of cultural history but it also grows to a gesture of benevolence.